The Alexander Archipelago wolf is a subspecies of the gray or timber wolf and is found in southeast Alaska. The information that follows is from the referenced report by Person et al. (1996). This technical report was published by U.S. Department of Agriculture, Forest Service. Person, David K.; Kirchhoff, Matthew; Van Ballenberghe, Victor; Iverson, George C.; Grossman, Edward. 1996. The Alexander Archipelago wolf: a conservation assessment. Gen. Tech. Rep. PNW-GTR-384. Portland, OR: U.S. Department of Agriculture, Forest Service, Pacific Northwest Research Station. 42 p. (Shaw, Charles G., III, tech. coord. ; Conservation and resource assessments for the Tongass land management plan revision). We summarized the scientific information available for the Alexander Archipelago wolf (Canis lupus ligoni) in the Tongass National Forest of southeast Alaska. Information concerning the morphology, distribution, taxonomy, genetics, and ecology of wolves is presented. Three issues for the conservation of wolves in southeast Alaska are discussed: loss of long-term carrying capacity for deer due primarily to extensive timber harvesting, increased mortality of wolves associated with improved human access from roads, and continued high levels of harvest of wolves by humans. Continued timber harvesting at current levels and by current methods will likely have adverse consequences for some segments of the wolf population. Although some short-term regulatory changes and the management of road access may need to be considered to keep wolf harvest at a sustainable level, the most important consideration is to maintain long-term carrying capacity for deer, the principal prey for most of the wolf population. A series of old-growth forest reserves may provide an effective strategy to increase the likelihood that wolves will persist where extensive timber harvesting has occurred, or is planned. Keywords: Alexander Archipelago wolf, Canis lupus ligoni, effects of logging on wildlife, population dynamics of wolves, predator-prey dynamics, roads and wolf mortality, Tongass National Forest, southeast Alaska. 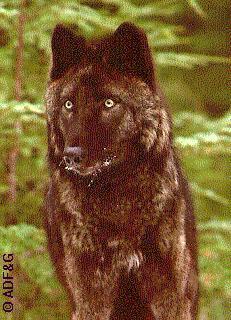 The Alexander Archipelago wolf (Canis lupus ligoni) occupies most of southeast Alaska from Yakutat Bay to Dixon Entrance except for Admiralty, Baranof, and Chichagof Islands. Based on common cranial characteristics, the Alexander Archipelago wolf was considered by early taxonomists to be a distinct subspecies. Recent taxonomic work suggests that these wolves may have originated from a larger subspecific group (C. l. nubilus) that at one time inhabited most of the contiguous Western United States. Wolves probably entered southeast Alaska sometime after the Wisconsin glaciation, following the northward expansion of black-tailed deer (Odocoileus hemionus) along the coast. The hypothesis of a southern origin is supported by recent genetic research showing that wolves in southeast Alaska share a common allele not found in a sample of wolves from interior Alaska or the Yukon. The population is relatively isolated from other wolf populations by water and mountain barriers. A study of the ecology of wolves in southeast Alaska was conducted on Prince of Wales and Kosciusko Islands from 1992 to 1995. Average home-range size of radio-telemetered wolves was 280 square kilometers (109 mi²), with 75 percent of the radio locations for each pack within core areas averaging 124 square kilometers (48 mi²). Pack sizes ranged from 2 to 12, with 7 to 9 typical in early autumn. Annual rates of dispersal averaged 39 percent; 71 percent of dispersers were adults 2 years old and older. Dispersal distances were relatively short (13 to 182 kilometers [5 to 71 mi]) presumably due to inter-island water barriers. Wolf movements were more restricted during the denning and pup-rearing season (mid-April through August), when home ranges were 50 percent smaller than in winter. Of the 14 dens located in this study, all were in old-growth forest within 100 meters (328 feet) of fresh water. One den was under a large log; all others were in cavities beneath the roots of large trees. Sitka black-tailed deer (O. h. sitkensis) were the primary prey of wolves. Deer remains occurred in 90 percent of wolf feces (scats) examined from Prince of Wales Island. Deer occurred exclusively in 45 percent of the scats. The only other prey occurring with >10 percent frequency was beaver (Castor canadensis). Other prey consumed in small quantities included black bears (Ursus americanus), mustelids, other small mammals, birds, and salmon (Oncorhynchus spp.). Using information on diet composition, consumption rates, and body size of prey, we estimated that wolves on islands in southern southeast Alaska consumed an average of 26 deer per wolf per year (SE = 4.1). Most of the wolves in southeast Alaska occur on the large islands south of Frederick Sound. These islands (game management units 2 and 3) support approximately 60 to 70 percent of the total population. By extrapolating from empirical population estimates for Prince of Wales Island, we estimated the autumn 1994 population of wolves in southeast Alaska at slightly over 900 animals (SE = 216). Hunting, trapping, and illegal killing accounts for a high percentage of the mortality in wolves. Based on analysis of trapping and hunting morality by wildlife analysis area (WAA), we determined that mortality was correlated with the linear kilometers of road within WAA's. Indeed, reported wolf harvest increased twofold when the length of road below 370 meters (1200 ft) elevation exceeded 95 kilometers (59 mi), regardless of size of the WAA. This corresponded to an approximate road density of 0.4 kilometer per square kilometer (0.7 mi/mi²), most of which were open to human access. Between 1993 and 1995, the average annual mortality in a total sample of 24 radio-collared wolves on Prince of Wales Island was 50 percent SE = 13 percent). If applied to the overall wolf population on Prince of Wales Island, this rate of mortality would not be sustainable. Wolf populations are closely tied to population levels of their ungulate prey. For southeast Alaska, we predicted the number of deer required per wolf to attain equilibrium between deer and wolves by using a Monte Carlo simulation of a model that calculated equilibrium ratios for wolves and their ungulate prey. We assumed a high average finite rate of increase for deer (1.3), a mean predation rate of 26 deer per wolf per year, and a human harvest of deer equal to 21 percent of the annual increment. Our results suggest that 170 to 180 deer per wolf are needed for a 95-percent probability of equilibrium, provided that mortality of deer due to predation is primarily additive. We cannot suggest a minimum deer population because we do not know what constitutes a minimum viable wolf population either demographically or genetically. Nevertheless, if we expect to sustain the current postdenning population of 250-300 wolves on Prince of Wales Island (along with subsistence and sport harvests of deer) with a high probability of attaining equilibrium, then sufficient habitat is needed to support 42,500 to 54,000 deer. Our review raises a number of issues concerning the long-term sustainability of wolves in southeast Alaska. Many more data are needed on wolf population structure, genetic structure, and predator-prey relations to fully address these issues and the overall question of viability. The Alexander Archipelago wolf exists in small numbers in a rapidly changing insular environment. Projected growth in human population, increasing road access, and the continuing loss and fragmentation of high-quality deer habitat will increase the risk of not maintaining a viable, well-distributed population of wolves in southeast Alaska. The area of most immediate concern is game management unit 2, including Prince of Wales and Kosciusko Islands. Management actions that address risks to wolf populations include modifying hunting and trapping regulations as necessary, limiting construction of new roads and effectively closing some existing ones, and modifying timber harvest strategies to minimize fragmentation and loss of critical deer winter range. Habitat to support a minimum density of 5 deer per square kilometer (13 deer/mi²), where deer are the primary prey for wolves, would provide for current levels of deer harvest by hunters, trappers, and wolves. In areas less productive for deer, maintaining current densities of deer is particularly important. Setting aside contiguous blocks of habitat within each biogeographic province that are large enough to encompass at least one wolf pack core home range (200 square kilometers [76 mi²]) would markedly increase the likely persistence of wolves, especially if the reserves contain high-quality deer habitat sufficient to support an average density of deer equal to 7 deer per square kilometer (18 deer/mi²). The objective of maintaining undisturbed blocks of habitat within each biogeographic province is to assure the persistence of several wolf packs that will serve as source populations capable of replacing wolves that periodically disappear from adjacent disturbed lands. In 1990, wolves in southeast Alaska were identified by a USDA Forest Service-sponsored interagency committee as a species for which there may be concerns about viability or distribution as a result of extensive timber harvesting in the Tongass National Forest. In December 1993, the Biodiversity Legal Foundation (Boulder, CO) and an independent biologist from Haines, AK, filed a petition with the U.S. Fish and Wildlife Service (FWS) requesting that wolves in southeast Alaska be listed as a threatened subspecies pursuant to the Endangered Species Act of 1973, as amended. The FWS ruled that listing was not warranted at this time, but added: However, it is clear by our analysis that without significant changes to the existing Tongass Land Management Plan, the long-term viability of the Alexander Archipelago wolf is seriously imperiled. Following that notice, this assessment was prepared under the auspices of the memorandum of understanding among the Forest Service, Alaska Department of Fish and Game, and the Fish and Wildlife Service. They, along with the Regional Forester, Alaska Region, requested that a conservation assessment be prepared to summarize available scientific information on the status and ecology of wolves in southeast Alaska, and to identify issues regarding their long-term viability and distribution. This conservation assessment was chartered under the Tongass [National Forest] Land Management Plan revision and the interagency memorandum of understanding (MOU) among the Alaska Region of the Forest Service, the Alaska Region of the U.S. Fish and Wildlife Service, and the Alaska Department of Fish and Game to conserve species tending toward listing. Our report summarizes the most current information available on the taxonomy, genetics, distribution, ecology, and population dynamics of wolves in southeast Alaska. Much of the information has not been published. In particular, we have drawn heavily from ongoing studies on wolves in southeast Alaska that is cosponsored by the USDA Forest Service, the Alaska Department of Fish and Game, the U.S. Fish and Wildlife Service, and the University of Alaska, Fairbanks. Results from that work are preliminary.